The only trouble was that while all the meats looked fantastic, there was almost nothing to be found completely clear of vegetables. Dirty words like “kale,” “chard,” and “sprouts” pervaded nearly every item on the menu, including my choice, the Long Island Duck (obviously Mediterranean). 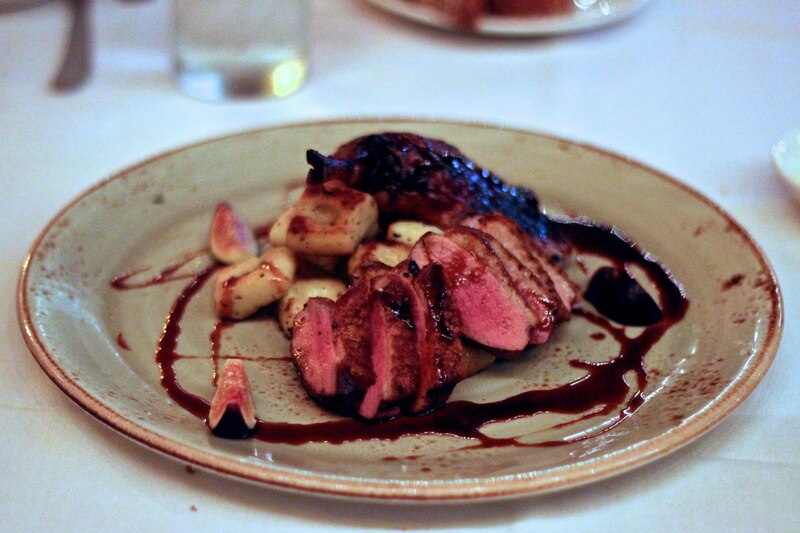 This quacky dish included both a roasted leg and breast, plus gnocchi, fig, spinach, lavender and duck jus. I ordered without spinach because it is just an unnecessary green leaf and eagerly anticipated my meal. The result was something truly delicious. The duck was perfectly cooked, keeping it juicy, but not oily. The gnocchi was also quite tasty and grilled, adding a new texture for me to the world’s greatest pasta. The figs were a nice touch and the duck jus was delicious for dipping. Best of all? Unlike similar dishes I’ve had in the past, this one filled me right up. Truly, if it weren’t for the lack of pure unvegan options, Casbah could have solidified itself in the annals of unvegan glory. As it is, at least they have no issue with catering to special needs.